Yesterday officially started April break for NHL. He has the entire week off, plus next Monday since it is the start of Passover. The morning began with the doorbell ringing before 8:00. 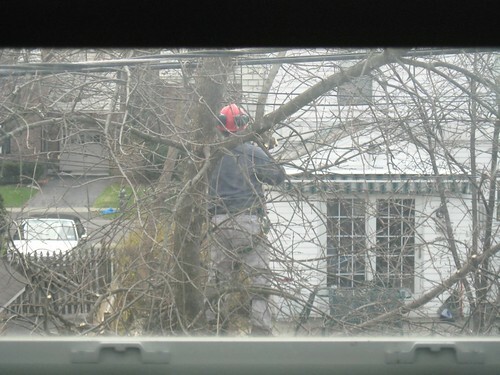 JL looked outside and saw a man with a bright orange helmet on and neon yellow vest. He went to the door. They were a tree service working for the power company taking care of the lines. They wanted permission to go in our yard and possibly use our driveway for their truck with the bucket to reach the trees. I granted them permission to use the yard and told them to let me know if I need to move my car later. Just after getting JSL down for a nap I hear the truck pull into our neighbors driveway. This sucker was loud and parked right outside my window. I went to the yard to watch and remind them to let me know if they needed me to move my car. A little while later they asked me to move my car so they could haul all of the tree branches up to the front without a problem. I moved the car. 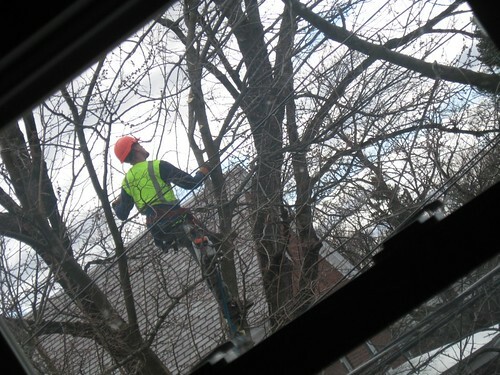 Then they told me that they had to come back and climb our trees since they were unable to reach the main problems with the truck. I decided this was a photo opportunity. I went into the attic and took these photos. 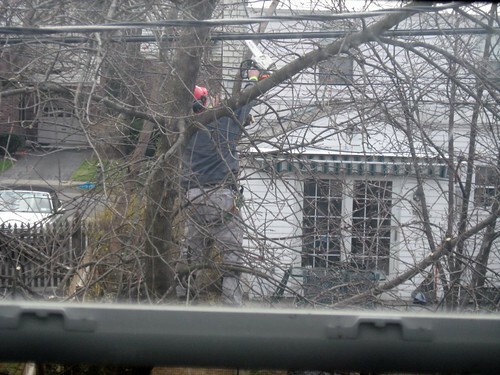 They are not the best, but were what I was able to get through the window with my zoom. At 11:00 we left the house since they were finally up at the other end of the block. They really took a lot off the trees, so hopefully we will not have any problems with the lines as we had feared before this. I packed the boys into the car and went to where JL works for NHL to have his adenoid x-ray done. JL met up with us and we told NHL that they were going to take a photo of inside his body. He was very intrigued with this. JSL and I stayed in the hallway while it was done. Afterward the x-ray technician showed NHL the films (they are all digital now). 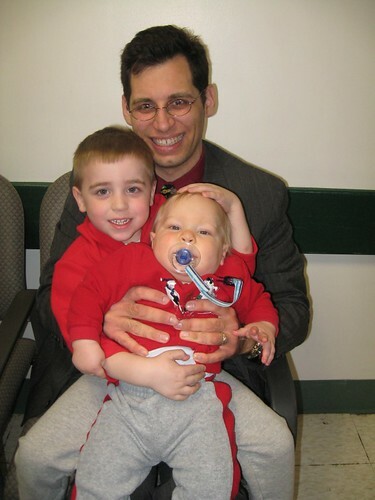 He was able to see his spinal cord, his skull and most exciting to him – his new big boy teeth. They are underneath his current teeth and ready to come in soon. NHL was beyond thrilled to be shown the films. 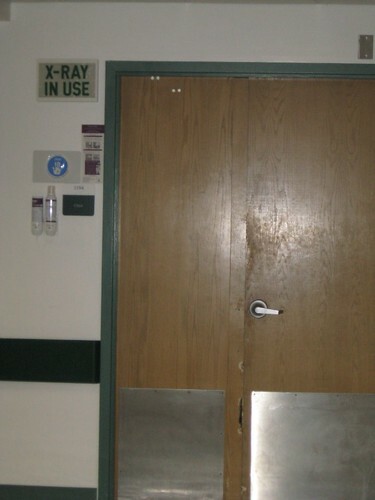 We then had to wait in the hall to make sure the films were good enough for the radiologist. While we were waiting I took a photo of my three boys. What you can not see in the photo is that JL is wearing a Sesame Street tie and NHL has on an Elmo sweatshirt. Everyone there thought we had planned it, but we did not. Right after we had the clear we went to visit people in JL’s department and then went to the cafeteria for lunch. After we went shopping for a few things the boys and I went home. When we arrived I saw a package on the porch. 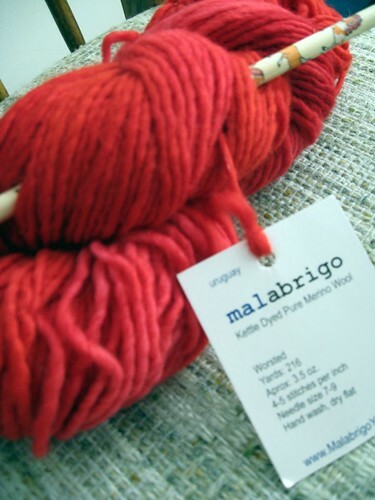 Inside the package was the malabrigo yarn (Kettle Dyed Pure Merino Wool for those that do not know) from Pony Knit. 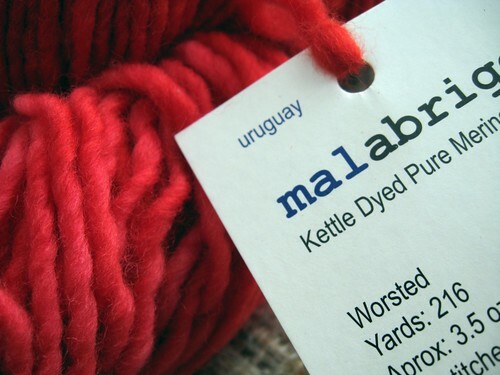 Oh my goodness this is the most amazing yarn that I have ever felt. Now I just need to figure out a project that is worthy of this fabulous fiber. Thank you so much! Once inside things started to fall apart some. From this point on JSL was a mess. He would not stop crying, clinging to me and would not eat any solid foods. He only wanted to nurse. Not something you would expect from a baby who was 11 months old yesterday (I can not believe my baby is going to be 1 in less than a month). I chalked it up to major teething pain, being constipated, and possibly an earache. I gave him teething tablets, they did nothing. Finally I decided it was time to do Tylenol per the dentist’s instruction. It hardly helped. JSL nursed a few more times before bed and woke up early on. He was all congested and was a mess. He eventually fell back to sleep in our bed for the night. The poor little guy was not comfortable. He kept waking up at least every hour and would cry for his binky. There were other times that he wanted to be rocked. Finally at about 4:00 we felt he was overly congested so I used the saline and bulb syringe to clean him out. Let me just say – ICK! That helped him to nurse some and fall back to sleep breathing a lot better. Today is pretty much the same. He has solved the one problem thanks to drinking lots of milk. At least I know his stomach is better. Now he is just congested, clingy, screaming, crying and all around miserable – please note the sarcasm here. I have a feeling it is teething (3 molars moving in and another tooth about to cut can do that), but worry that it is his ear. If his temperature goes up more and we have another bad night I will have to call the doctor tomorrow. Slight conflict since NHL has his allergy testing tomorrow in the late morning. The mucinex is helping JSL to be less congested and the tylenol seems to be allowing him to nap for the time being in his crib. Hopefully he will be fine and those pesky teeth will move along quickly. Tonight I have to be to the airport at about midnight to pick up my parents. They were in California for my Cousin M’s wedding. I was so bummed about missing this. Mazel Tov again M and B on your special day and have a wonderful honeymoon. What a gorgeous shade of red! What are you going to make with it? I hope your little one feels better soon. YAY! So glad it arrived safely! It wouldn’t fit into the padded envelopes that I had (waaay to squishy). Happy Knitting! Poor little guy!! i hope JSL is feeling better soon!